"For all the world's a virtual stage..."
Samsung has announced the launch of its Digital Theatre App for its Smart TV line, bringing bespoke content from Britain's leading theatre companies. In a fascinating move, the Korean giant has decided that content is indeed king, and has partnered up with Digital Theatre and the likes of the Young Vic, Royal Shakespeare Company, Regent's Park Open Air Theatre and the Almeida Theatre to produce multiple camera performances. 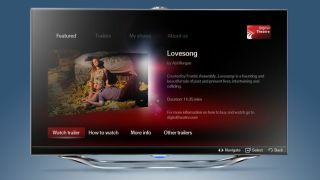 The offering will enable Samsung Smart TV owners to watch performances like All My Sons with David Suchet, Much Ado About Nothing with David Tennant and Parlour Song with Toby Jones. Of course, channels like Sky Arts have been offering theatrical shows, but to produce its own content in an app is a statement of intent from Samsung. One of its key rivals, Sony, is already one of the world's leading content producers, and Samsung is keenly aware that its Smart offering must be competitive against other manufacturers. "The launch of the Digital Theatre App onto Samsung Smart TV opens up the world of theatre to the public, allowing people to choose what they want to see, when they want to see it," said Lali Parikh, strategic content manager for Samsung UK. "The drama of the performance is intensified through the picture and sound quality of the range, creating a incredibly immersive experience for viewers." Although theatre performances are unlikely to prove as popular as the iPlayer or as mainstream as Premiership football, it's increasingly obvious that Smart TV's 'killer app' is bespoke video on demand content.